In moments that you cannot be near your child but you don’t want to strap them to a bouncy chair or a small play area, the Regalo Home Accent Walk-Thru Gate is the perfect solution to the problem. With this safety gate, you can restrict your child’s movement from entering hazardous places such as the kitchen or the stairways, but still give them the flexibility to move around and play in the safe zones. This sturdy safety gate is a pleasure to have at home, and safe for your children to be around. No matter how active or strong they are, they will not be able to open or push the gate down to reach the dangerous areas around the house, giving you the peace of mind that you need when it comes to your precious bundles of joy. The Regalo Home Accent Extra Tall gate is made of hardwood and steel – a solid combination that makes the gate sturdy and strong. The attractive design and universal look blends easily with any kind of décor and doesn’t stand out or damage the look of your home. This gate has been certified to be safe by the Juvenile Products Manufacturer’s Association (JPMA) and contains zero PVC. It is also a pressure mounted unit, and requires to tools to install. The Regalo Home Accent has fit into any opening that you want to restrict for your children, such as the kitchen area, staircase, balcony, doorways or between hallways and furniture. The gate fits an opening between 29-1/2 inches to 44 inches, and stands 38 inches tall. The swinging door opens at 2.5 inches, and two extensions – measuring 4 inches and 6 inches – can be used to extend the gate to fit a larger opening. The Regalo Home Accent stands at 38 inches high – which is high compared to most of the safety gates available in the market. The added height makes it difficult for older children to try and climb it, or for pets to jump across. It also makes it easier for adults to open and close the door with their hands to move across the gate without having to stoop or bend down. The built in door is easy to use as it has an easy-close handle, which allows the door to close on its own simply with a gentle push. The door also contains a child proof lock that neither the children not pets can master easily. 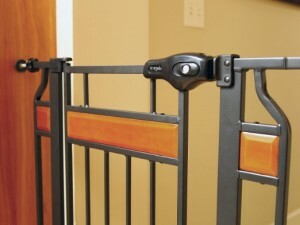 The pressure mount procedure makes the gate easy to install, without the need of any tools and in a matter of minutes. It also means that the gate can be moved to other locations if needed without causing damage or holes to the walls. Since the gate is pressure mounted, many parents prefer not to use them in locations that can be risky, such as at the top of the stairs or on the way to the swimming pool, etc. Being pressure mounted, there is always a probability that a very persistent child or pet will be able to push the gate down, thus exposing themselves in dangerous situation.